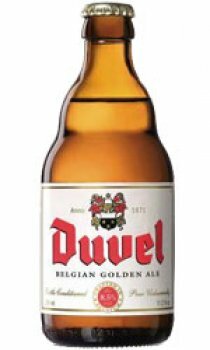 Duvel has a fruity dry aroma, owed to the finest hops, that reminds experts like Michael Jackson of Poire William concerning its bouquet and palate. Its dry but still alcohol-sweet flavour makes the beer an excellent thirst-quencher, with a pronounced hop aroma. Thanks to the balance between a fine aroma and subtle bitterness, this beer occupies a unique position in the rich Belgian Beer tradition. Duvel is the perfect companion for appetisers, digestives and every other occasion. A bit too strong for my taste. Undoubtedly a well made beer, I found it a bit to strong, both in terms of flavour, and alcohol, for me. Flemish for "Devil", and it certainly is at 8.5% abv, but what a fantastic beer! Recently read an interview with a british beer producer, when asked what his favourite beer was, of course he named the one he was producing. But when they asked him what his favourite beer from outside of the UK was, he replied "Duvel, it's genius". Couldn't agree more.